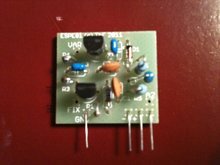 This module improves the volume response of the Etherwave Pro. Original Etherwave Pro theremins have what is called a snappy response. The softest audible sound is already quite loud, as silence is followed by a jump in volume from zero to a starting level of about -40dB. The consequences are not only a reduced dynamic range but also the impracticality of sophisticated expression at very low volume. Please note, the EPVM1345 module does not function on the Etherwave Standard and Etherwave PLUS theremins.